My sweet friend Naomi, from Creative Bug on the Loose left a comment on yesterday's post Treble birthday, asking how I created the computer card featured in the post. While I can't, for now, post step by step pictures of how I did it, I'll do my best to give you as full a tutorial as possible. If, or more likely when, the same design is used for another card, I'll try and remember to take photos as it's created and post a complete tutorial then. 1. As soon as the idea formed in my mind that I wanted to create the card and knowing it would be impossible for me to accurately recreate a keyboard, I did a Google image search for computer keyboard. Looking through them, I found the image I wanted, with a gray background to the keys. I downloaded it and then printed it using the 5"x7" size (the keyboard is be around half the height), printing 2 copies in case I made a mistake. 2. I took a letter/ A4 size piece of white card and folded it in half, to form the base, knowing it would need trimming during the next step. 4. From another letter/A4 size piece of card, this time a light gray and white, which I thought would be appropriate for the main computer, I cut a piece for the monitor, approx 5" deep and the same width as the base card, then rounded the corners. 5. I cut a piece of black card to the same size as the gray, to be used as the screen, again rounding the corners. 6. Here's where it got tricky! My first idea was to cut a frame from the gray and white, and pop it up on the black card using foam dimensionals. Leaving a border of 5/8'' on all sides, I used my craft knife to cut the frame. But I unintentionally didn't cut right through the card and when I tried to do so, it ripped the card. Boo! 7. Instead, I trimmed the black card to the size I wanted and then cut another monitor sized piece from gray and white. Not wanting the screen to be too far from the frame, I used double sided tape instead of dimensionals to attach it. 8. 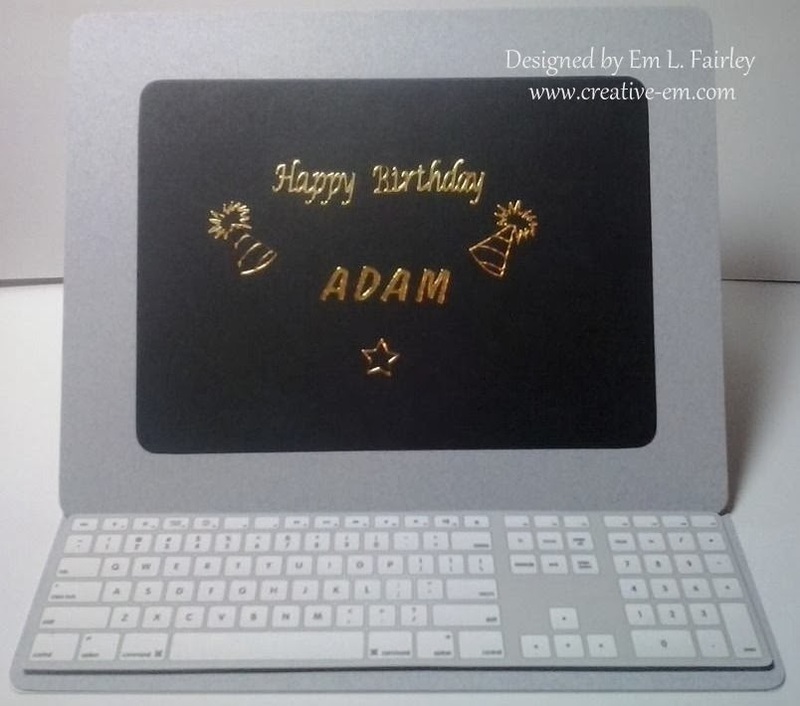 Using gold peel offs, I added the happy birthday Adam, the party hats and star to the screen to complete it. 9. From more silver and white card, I cut a piece the same size as the inside of the card, again rounding the corners, then attached it with double sided tape. 10. To complete the card, I popped the keyboard up with more foam dimensionals, and added it to the bottom edge of the inside. This meant that when the easel was opened, the monitor would rest at an angle, just as a real one does. I'm so pleased with the way it turned out despite the slight disappointment of having to change the monitor and screen around. When the design is made again, I'll remember to press harder with the craft knife so it can look more realistic. I hope I've explained everything clearly. If you've any questions, please leave a comment. In my post on Monday, I mentioned that one of my clients, Gayle, had commissioned a lot of cards from me. I'm now able to reveal the first three of them! Yay! Firstly, for Sophia, who loves playing frisbee. 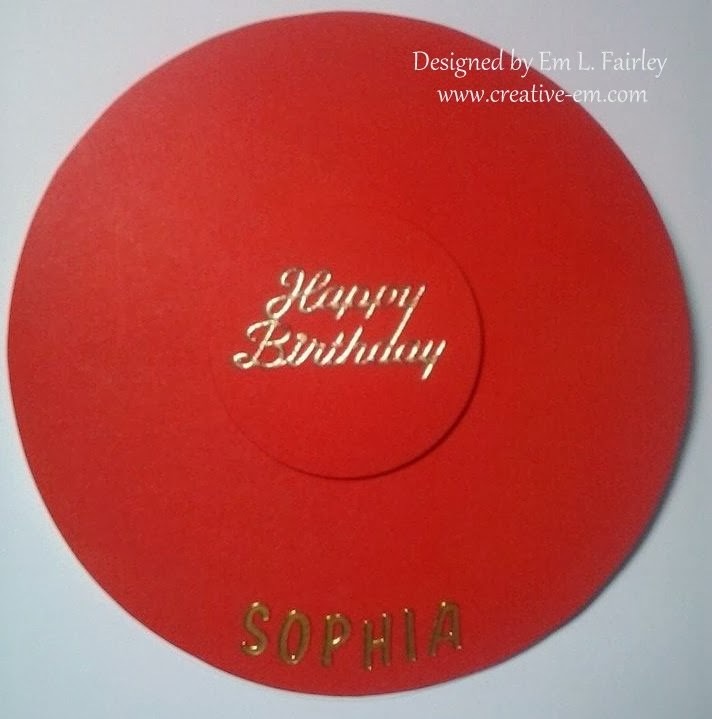 Gayle asked if I could add one to the card, but I took that one step further and created the card as a frisbee! It's an easel card, but I forgot to take a photo of it open. Oops! It was Sophia's birthday a few days ago, so belated birthday wishes go to her from me today. Next up is a card for Lesley, Gayle's Mom, who celebrates her 70th birthday today. The style of card is one that you'll recognize from some of my recent posts, because it's a current favorite of mine. Happy birthday Lesley! 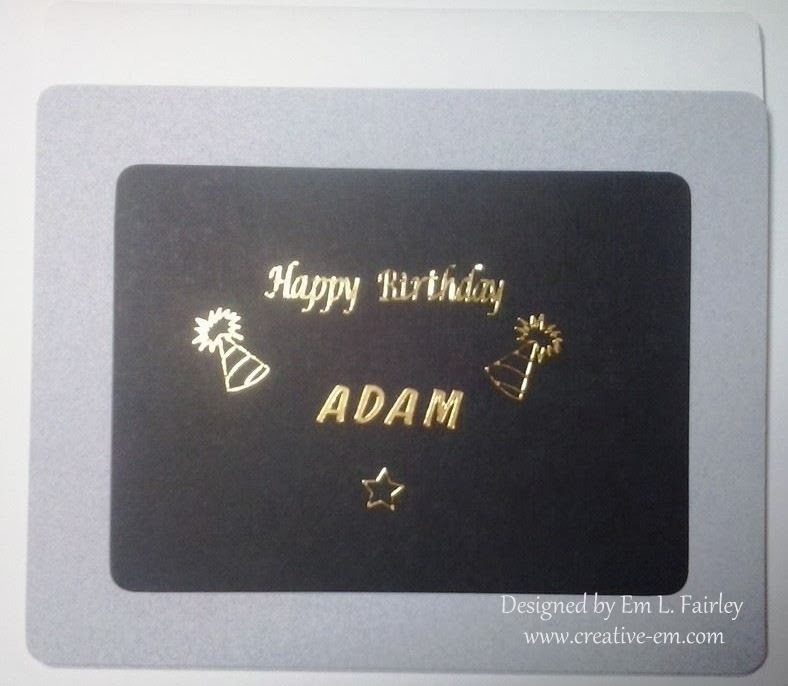 Last for today but by no means least, is quirky card for Adam, Gayle's nephew who also celebrates his birthday today. Gayle mentioned that he is a computer geek, so, it immediately gave me the idea for his card. It's another easel card and this time I did remember to take a photo of it open! Happy birthday Adam! I'd love to know what you think of all of the designs, please leave a comment. Thanks! I'm very excited to let you all know that my dear friend, Naomi, over at Creative Bug on the Loose has something really special going on! 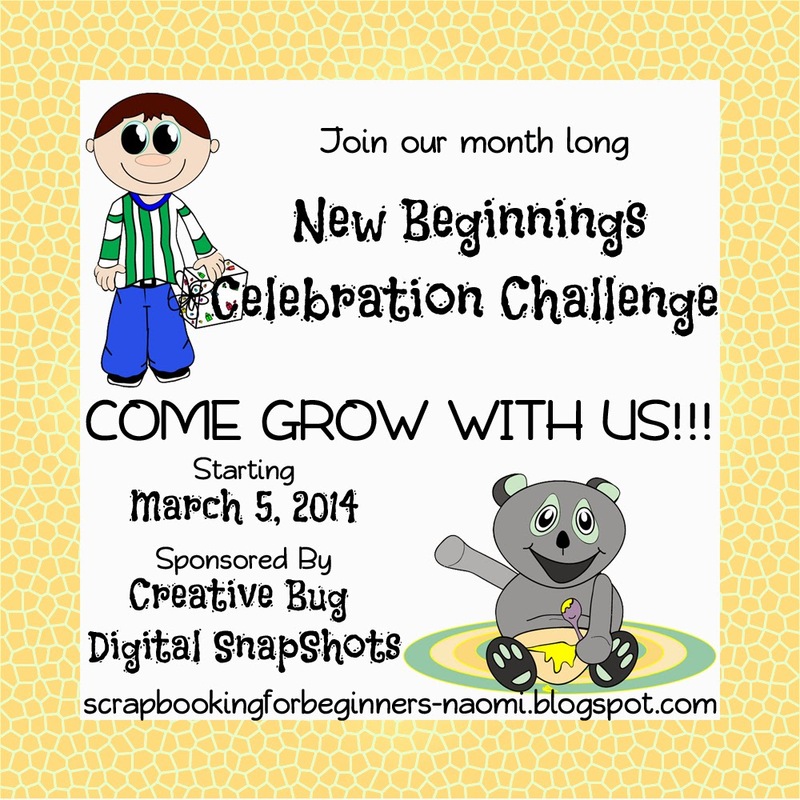 Beginning next Wednesday, March 5, Creative Bug Digital Snapshots will be launching and to celebrate, she and Lisa are hosting the month long New Beginnings Celebration Challenge. For more information, you can read their post by clicking HERE. I can't wait to take part! Congratulations on the new venture, girls! If you'd like to share it on Facebook, the original post can be found HERE. Also, if you follow my Facebook page, you'll know that last week I was very busy with a large commission order for a client. Gayle has now received her cards, but has asked that I don't publish them until the recipients' birthdays, in case they see them beforehand. The first of the birthdays is later this week, so I'm looking forward to being able to share the cards with you then. I've just heard that a very special recent piece has arrived with the recipient and so I can now publicly show the card. In creating it, a special gift for a very dear friend, indeed Zane is more my brother, I knew it had to be one of, if not my best ever creation. I'm very proud to say that I achieved that. Zane and his wife Jenny's comments upon it's arrival, have brought me to tears, which as I write now, are still falling. I was also in tears while I worked on it. Words cannot express how honored I am to have created something that has touched them both so much. 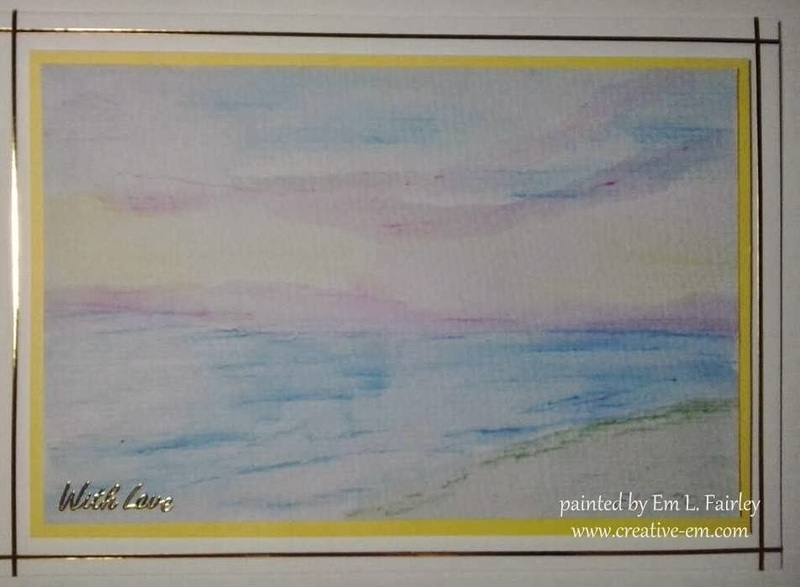 The scene is my interpretation of one of Zane's photographs, sunset over the Atlantic, and is the first time in years that I've done any painting. Just a quick post today to share with you the card I designed for the most amazing man I've ever met, my soulmate, Dave. I'm so sorry that I've not posted as often as I said I would, it's only been a temporary slip and I'm back on track now, I promise. Recently there seems to have been an "explosion" of card in a box creations around the bloggy world, and so I thought I'd better get on trend and quick! Most tutorials or explanations I've seen describing this technique involve using two struts within the box. However, I thought that looked a little fiddly for me. 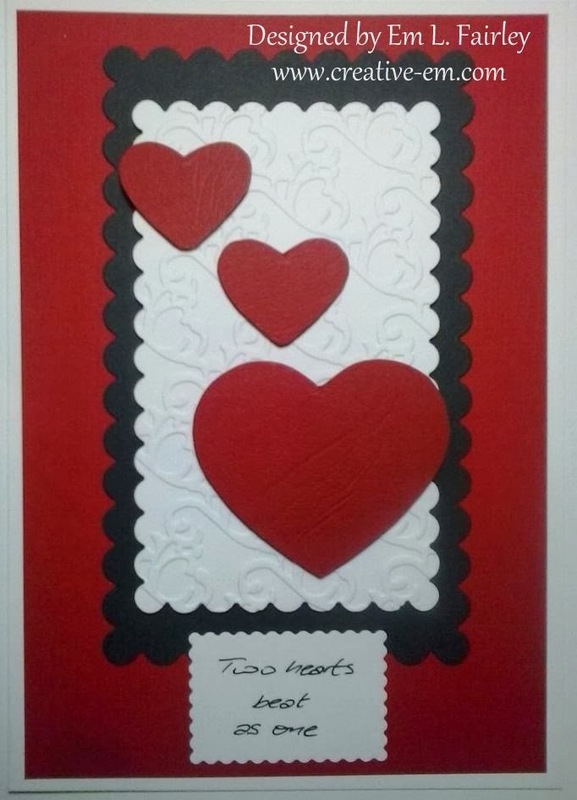 I was thinking of a way around it, when I came across the perfect solution from Carole at Extreme Cards and Papercraft. In her post Card in a Box Valentine Carole not only describes how using a band of card inside will solve the problem, she has also very kindly given a cutting file/PDF template for the box. 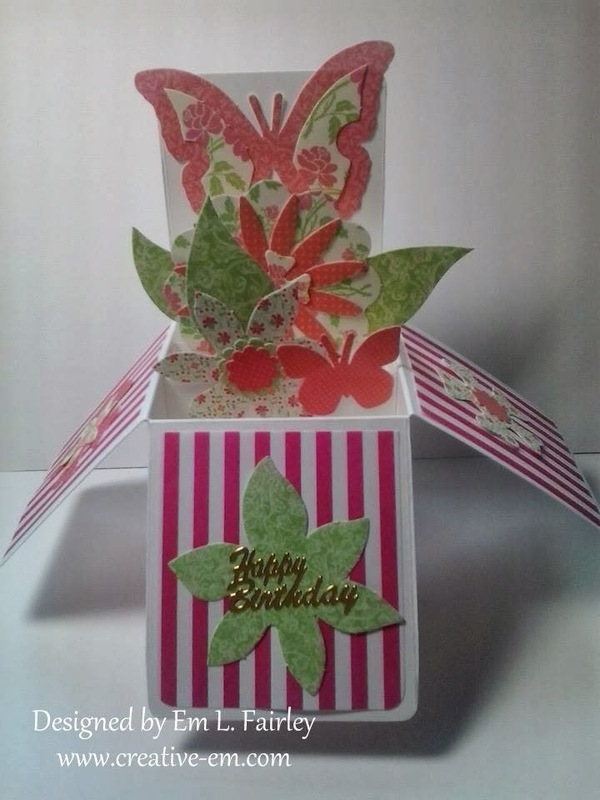 To create my card in a box I used the dimensions she gives in the post, instead of printing and cutting the template, but even doing it this way it was SO easy! Thanks so much Carole! 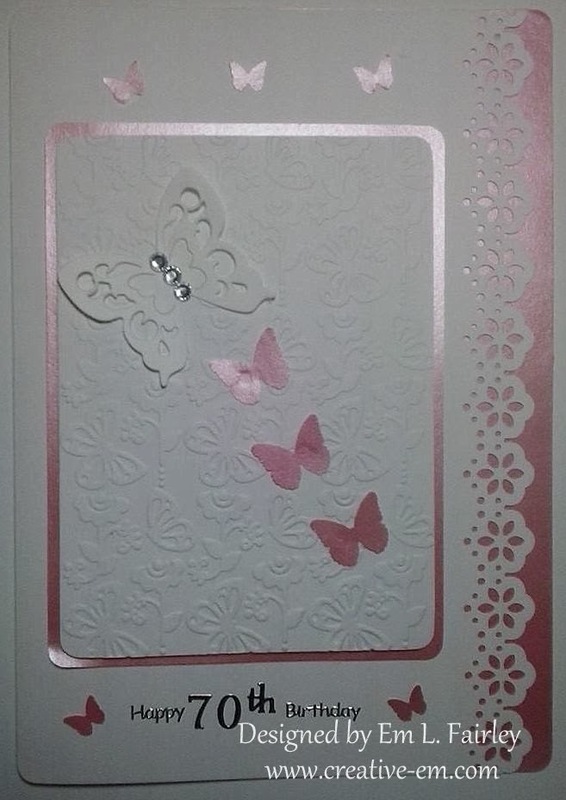 I used a corner rounder punch to shape the flaps and the back panel, though the edges of that are hidden by the butterfly's wings. To decorate the box I cut pieces of thin pink and white pattered paper that are 1/4" smaller than the panels (2-1/2" x 2-3/4") and rounded two of the corners before adding them to the panels using double sided tape. The die cuts are all from the Dovecrafts "Garden Party" range and I've used a wet glue to stick the pieces together and adhere them to the inner band, the back and the panels. Even though the embellishments spill over the edge of the box, it does fold flat and will fit in an envelope easily. This is my first card in a box and I can see me creating many more. 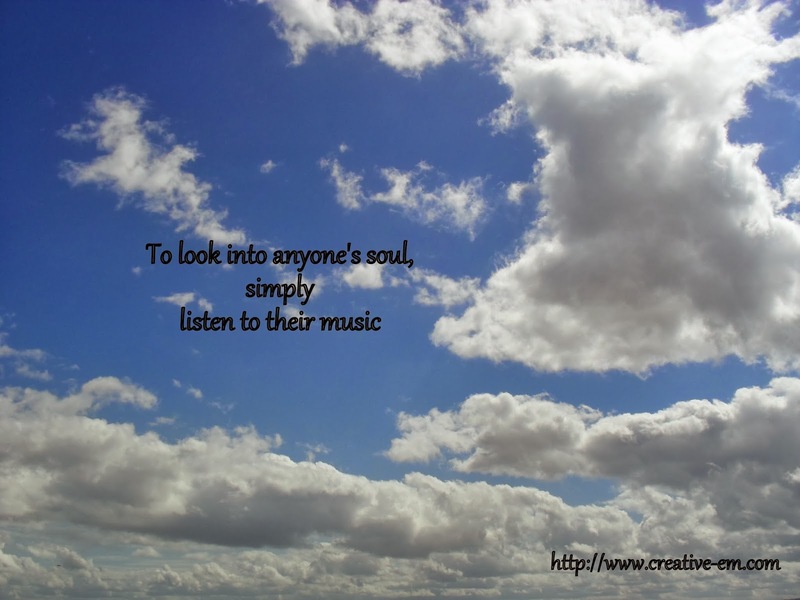 I'd love to know what you think so please do leave a comment. Thanks!